This might sound strange, but I've been pondering Winnie the Pooh lately. Actually I've been thinking about all the well-known characters that inhabit the Hundred Acre Wood and how A.A. Milne did such a fabulous job of weaving together pithy, delightful stories about them. Who doesn't know someone a little bit like Owl, the out-of-touch, good-natured know it all? Or Rabbit, the holier-than-thou insecure critic? What makes these stories powerful is the personalities involved, and how we can bring those traits -- and the stories involving them -- into our own world. For most of my life, I have struggled with joy. 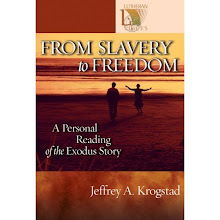 Being raised on a farm, the third son of Scandinavian Lutheran parents, joy was not a commodity I came by naturally. Make no mistake, I had a fantastic upbringing. But joyful exuberance wasn't something that was encouraged in my early years. So as I think about the denizens of Milne's stories, the one I have pondered more than any other lately is Roo. Seem strange? Roo is quiet, most of the time, out of sight, innocent and childlike. Forgettable, even, if you're not paying attention. But what strikes me about Roo is the power of his joy. He is the epitome of the word "irrepressible" -- perhaps akin to Tigger, but less likely to knock people over. I think every time I've experienced a windstorm in the last few decades, I've thought -- and frequently said out loud -- "Can I fly Piglet next?" It is probably my favorite line of Roo's. And if you recall the time Tigger got stuck up in a tree and was too afraid to come down, Roo was right up there with him, making a game of the whole thing -- and thoroughly enjoying himself. What gives Roo such consistency, such powerful joy? Maybe it is that he is loved well. Kanga certainly seems to dote on him in exactly the right balance of tenderness and discipline that a mother should have. Perhaps it is that Roo is, in fact, innocent -- though if you read the stories closely, he's had enough run-ins with nefarious (and hilarious) plots from the rest of the crew that he could well have gotten suspicious and fearful. And maybe that is what it comes down to. More than anything else, I believe Roo has something that in this day and age seems like a luxury to most of us. He has trust. He doesn't get anxious, he doesn't wring his hands and get all fearful about things, he doesn't angst about the stability of relationships or about the future or anything else. What happens as a result is that Roo is a little bit infectious, in the best of ways. He brings delight and warmth and, well, joy to the rest of the forest. 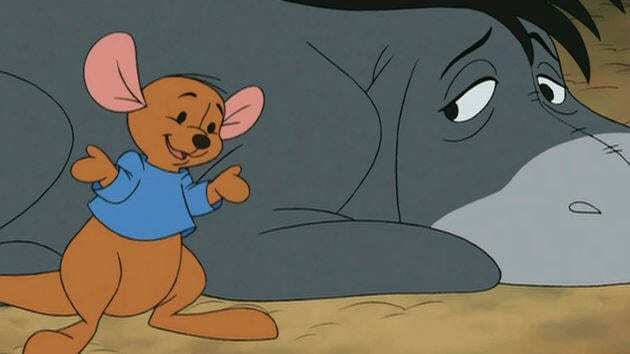 In the Disney animated versions, Roo is cute and cuddly. But in Milne's original illustrations, he's hard to see, little more than a pen-stroke. It's easy to miss Roo entirely. That, in fact, is often the way it is with joy. We take it for granted or set it aside or say there will be time for that later, but right now I'm busy. We do these things at our own peril. Like all the most powerful things in the universe -- add, maybe, love and hope to that list -- joy is impossible to control, impossible to demand. And these things -- these intangible things -- are what makes life worth living, in every moment. These are the things that have power to transform, if we'll allow them to do their proper work.